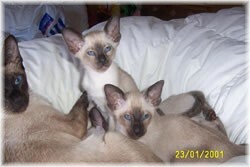 We are delighted with our classic Siamese cats from Hubbell Kittens. Anna (the breeder) was extremely helpful at all stages of choosing and buying, and we were made very welcome each time we visited "our" kittens in the period between choosing and actually going home with them. All the paperwork was provided along with helpful notes and she was there on the end of the phone when we needed to consult her. Our two little boys, Boris and Bryn (Hubbell Boris Godunov and Hubbell Brindisi del Mare) are great company for each other and for us! They are affectionate and sociable, and interested in everything we do --sometimes a bit TOO interested if it's typing or embroidery --and like nothing better at the end of a tiring day than to curl up with us and watch TV. Anna assured us she bred them for their temperament and we can bear this out. They are very good with children, and mix well with other cats. or so once their jabs are done. After we contacted you, You pointed us towards the web site. It has been very informative even though I'd owned Siamese before but you often forget how to handle kittens. Once we agreed to have the kittens we were in regular contact with you, we could visit and spend time with our new babies as often as we wanted. The web site also kept us informed of their progress. The kittens settled in very quickly following your advice. I believe this was because they have been brought up in a loving family environment. They are loving and affectionate. They adore my 9 year old daughter but when she's asleep I do get to have a cuddle. I am looking forward to many years of companionship. If you ever need a reference we have 2 beautiful friendly kittens, who have been very well house trained, we have not had one accident. I would like to thank you for our kittens and thank you for all the help and guidance that you have given us. They are healthy fun and very well behaved, well as well behaved as kittens can be. Having someone there to help us get used to the kittens and to refer to at any point has been invaluable. Lets hope your next litter is as good as this one and maybe we will extend our family(if I'm allowed!). You have a lovely web site, very easy to navigate. Well done on your first litter. I'd like to wish you all the best for your future breeding program and may you have many happy, lovely litters for years to come. Firstly I wanted to say how much I enjoyed your web site. I found you through kittymania and it was reading your kitten diary that finally convinced me to get a kitten after Cinderella, my old Siamese cat, died last July. It also made me realise that having kittens was harder work than having children! The children and I loved looking at all the pictures, but the site is informative too, making you really think about what you must consider when getting a new kitten. We were obviously disappointed that the kittens were already spoken for, but wanted to thank you for your help and support, and particularly for putting me in touch with Lesley at Spireshadow. As you know, we got Cressida from Lesley just two weeks ago and she is just wonderful. Our old Oriental cat (Rocky) is completely besotted with her, as are we all. So thank you once again, for an entertaining web site (I still check it for updates on the kittens!) but most if all, for your help in finding us such a wonderful kitten. Spireshadow Siamese Aaaaah aren't they cute!!! Lovely site Anna, enjoy checking it every day for news of the babies!